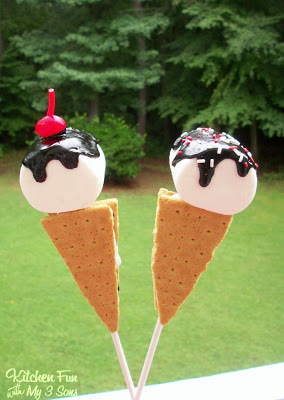 It is National Ice Cream Day so we thought we thought it would be fitting for us to share these Ice Cream S’mores Pops that we came up with. We used 2 square marshmallows (the ones made for s’mores), 1 jumbo marshmallow, 2 graham crackers, I special dark chocolate Hershey’s bar, 1 red jelly bean, 1 red Twizzler string, sprinkles, and lollipop sticks. We cut 1 large graham cracker into a cone shape. Use that cut out as a guide to cut out the other graham cracker. Melt the chocolate car on low heat in the microwave & scoop it in a baggie. Snip off the corner. Squeeze the melted chocolate on the inside of the graham cracker. Put 1 square marshmallow on top and cut the other one in a V shape to fit on the bottom. Squeeze more chocolate on the inside of the other graham cracker and press together. We popped ours in the microwave for just a few seconds to puff it up just a bit. Push the lollipop stick in the middle and leave some of it sticking out of the top. Press the jumbo on the top. Squeeze out some of the melted chocolate on the top of the jumbo marshmallow and spread around to look like fudge topping. Let dry. We took a red jelly bean and poked a hole in it and added a small strip of Twizzler string to look like a cherry. Press that onto the top of the marshmallow before the frosting sets. We added sprinkles to the other ice cream pop. 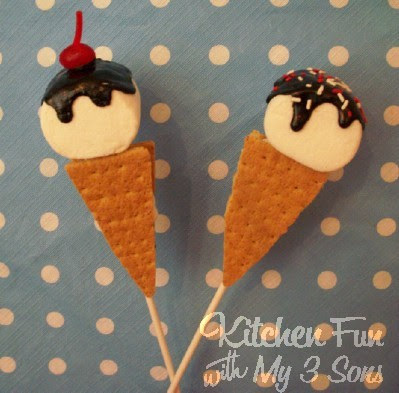 These are so much fun for the kids and they can fling them around all over the place and the pops will stay set. They loved having their ice cream with no worries of it melting in this crazy heat!! « Previous PostOH NO! The Turtle Turned Over Watermelon! amazing……you HAVE to be the most fun mom ever! You make my "fun" seem like a day in boot camp. HAHAHA!!! Absolutely adorable and clever! Love them! These are SOOO cute! How creative! That is too cute! Hi, Just paying a visit from the Alexa Blog Hop! Aaaawww, just the CUTEST…the pops AND the boys! Looks like Ice Cream to me! 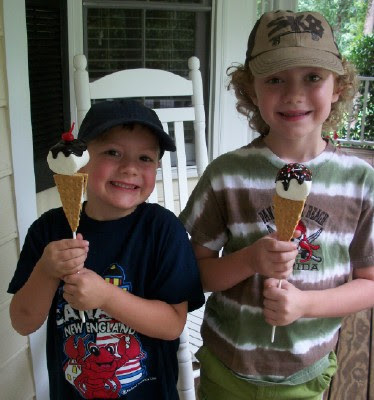 Please come share at our Ice Cream Linky Party! I bet the boys really loved them. Such a cute idea!!! And delicious, I'm sure! What a fun idea! I love that they won't melt the second you step outside into the scorching heat! 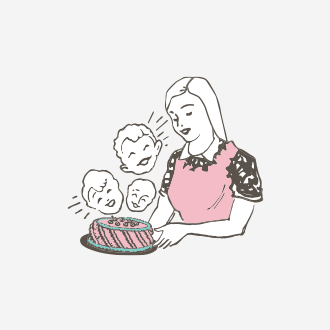 I can't wait to poke around and check out your other fun food ideas! This looks cool! 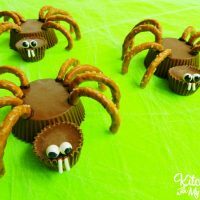 You're amazing at making fun treats! I would love it if you came by and shared some of your recipes with us at Cast Party Wednesday tomorrow. What a super fun idea! 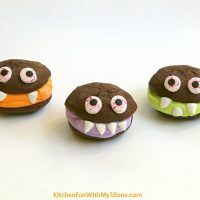 These would be perfect for a b-day party, too! Oh, these are adorable! What a special treat! My kids would flip over these! As would my mother, who loves cute food. Lol. Eeep! Too cute for words!!! What are original and delicious idea. I saw your link on This Chick Cooks. Great stuff! I posted my summer fruit tart if you'd like to check it out. My kids and husband love marshmallows and these are so cute! We will have to make these this weekend. Those are SO cute! 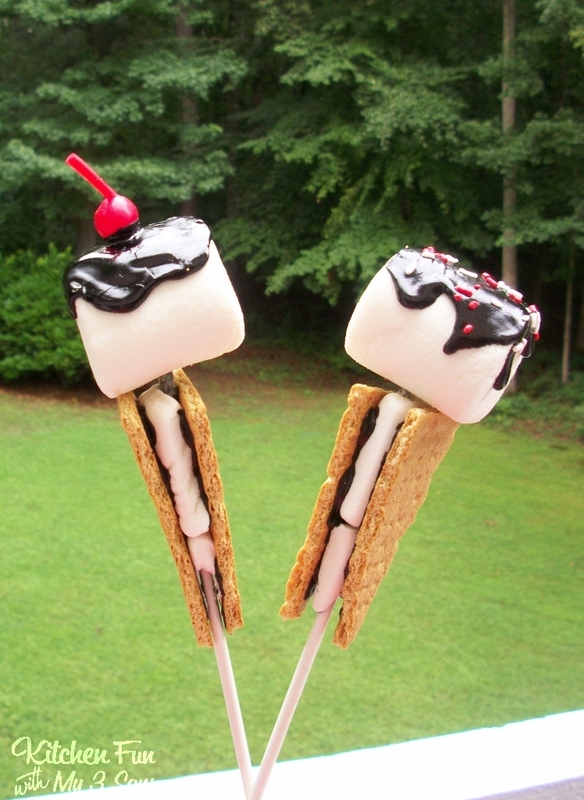 I love marshmallows and I'm off to hunt around your blog for more ideas! So cute, and I love the idea for your blog! You little guys are just precious! Your Ice Cream Smore Pops are just adorable. You are so creative! These are crazy adorable! Love Love! Another amazing idea! Love it!